It’s the start of a new season and pumpkin start popping on everywhere. Every year around this time I usually purchased some of the sweetest pumpkins for Halloween decoration, pies, soup and all the like cooking. We used to have lots of leftover that would still run until after thanksgiving, Christmas and such. That’s why I usually puree Pumpkins, and freeze them in 1 cup serving size batch. 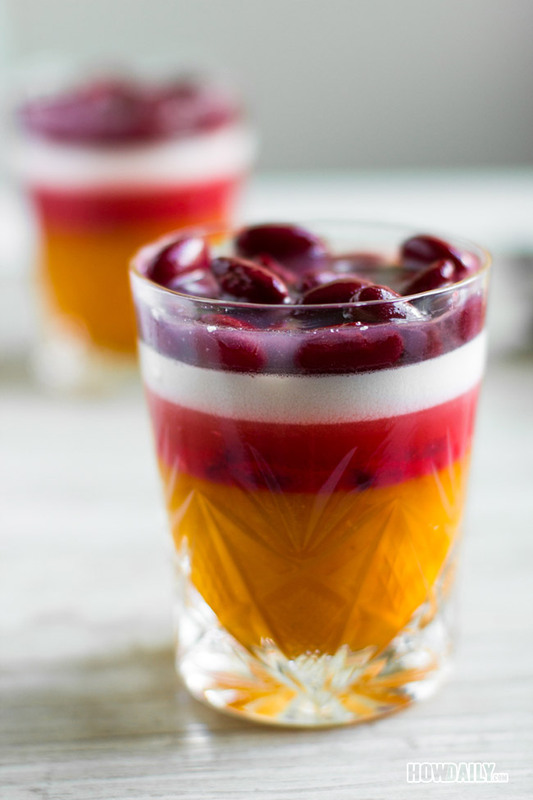 This recipe is an inspiration of the Fall colors: red, orange and white intertwine. 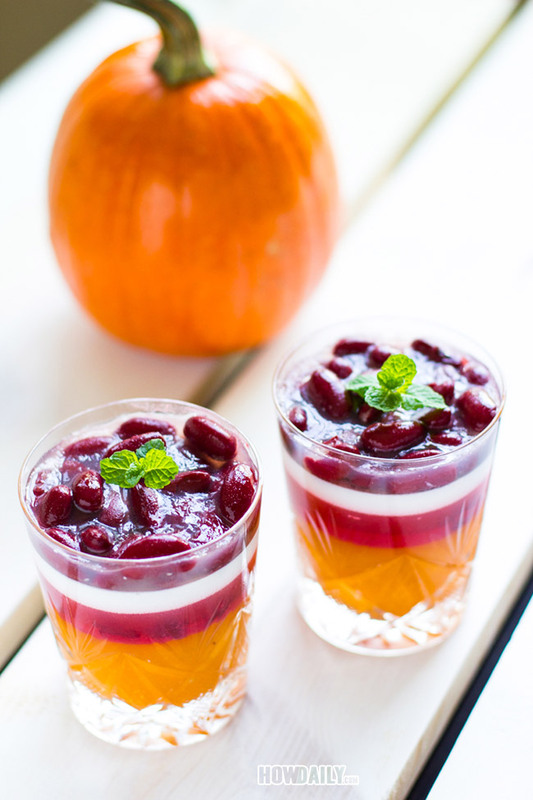 In every spoon, there’s a combination of the pumpkin’s sweetness, the mildly tender red bean and the creamy coconut. 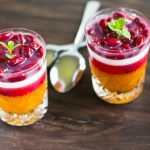 I love desserts that have a little bit of sweetness, not too bland but not over power either. That will be show in most of my dessert recipes, so depend on your preference, adjust the amount of sugar to taste. I chose red bean in this recipe due to its ability of shape holding even when being really tender, plus the natural beautiful crimson color. You can choose any types of beans to your favorites. Coconut milk is used due to its creamy, white colorant and greasy taste without the non-healthy affect. Coconut milk also contain lots of good healthy fat too. If you want the “real” fatty, then whole milk, heavy cream could be used too. 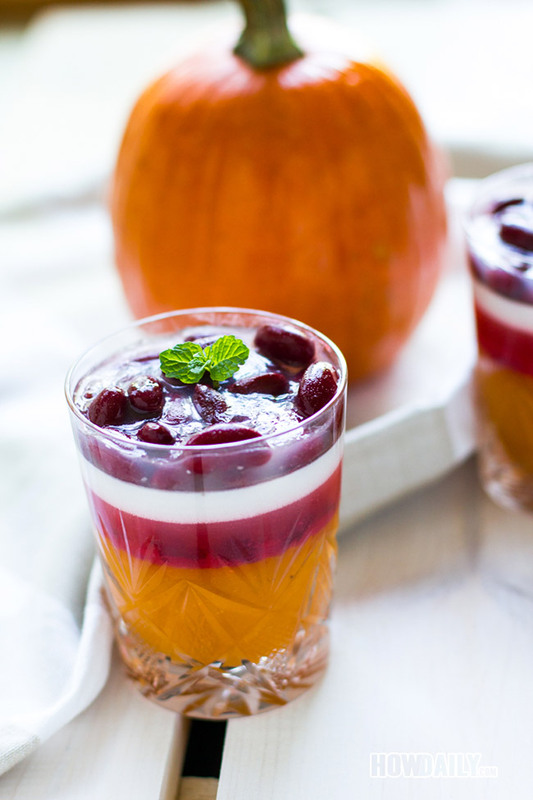 Decorate with a small mint stem and you have a dessert cup for welcoming the season. Use canned pumpkin to save time, or you can DIY if you have some fresh pumpkins at stake. Start by snapping off the stem of a small pumpkin. You can make it yourself from dry beans or use canned bean. If you want to cook from fresh, just follow the next few steps. Choose red kidney beans for the firm texture and shape, otherwise anything is fine. Drain the soaked beans, rinse and repeat. When done, turn off heat and sprinkle on some salt. In a large enough container, add 5 grams of Agar Agar Powder, 2 cups of water, and 1/2 cup of sugar. Stir to Mix. Let the mixture solution sit for 30 minutes to 1 hour to fully soak agar and dissolve sugar. In a small pot, add 1/2 cup of puree pumpkin and half of the Agar -Sugar Solution. Remember to stir before and when transferring the Agar solution to avoid over-residue in the remaining half. Stir to mix the pumpkin - agar mixture. Bring to boil for 30 second while stirring. Remove from heat, and carefully transfer to cups/jars to create the first bottom most orange layer of pumpkin agar. Let sit for about 20 minutes or until forming a somewhat firm-to-touch membrane. Mashed 3 Tbsp of red kidney bean. To create the next red layer, take 1/3 of the remaining Agar-Sugar solution and mix with 3 Tbsp mashed red bean. Add a drop of red icing color. Now very gently pour it over the formed pumpkin layer to create a thin red bean paste layer. Let cool for 10 minutes or until form a firm-to-the touch solid layer. Bring to boil for 30 seconds, and gently pour over the red paste layer to form a thin white coconut layer. 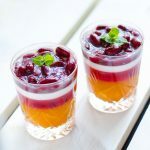 In each cup/jar, carefully add 1 Tbsp of kidney beans. Gently pan them out over the the white coconut layer to create an even red beans layer. Boil the remaining Agar-Sugar solution for 30 seconds. Pour over the red kidney beans. Let cool for 10 minutes so that all the beans are now stationary and form a nice translucent layer. Store finished cups/jars in fridge 2 hours to solidify completely before serving.